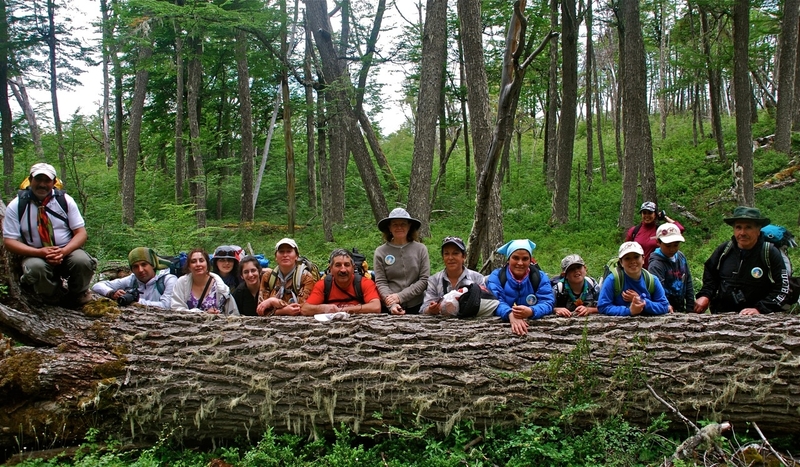 Last weekend (January 28 – 29), Conservacion Patagonica co-sponsored the 6th Annual Ruta de Huemul, a two-day community hike from the headquarters of the future Patagonia National Park to the town of Cochrane. The event, free of charge and open to people of all ages from Cochrane and beyond, engages participants in conservation and the fate of the endangered huemul deer. 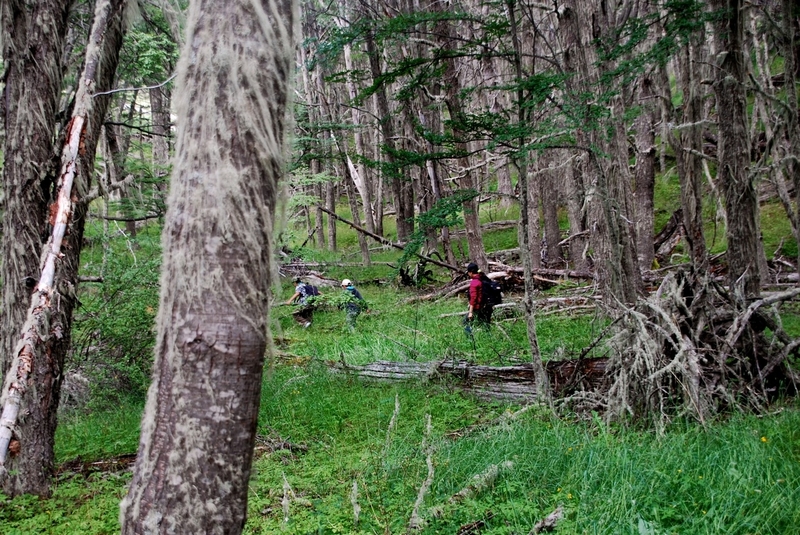 Hiking through lush southern beech forests, hikers have a chance to spy huemuls and other animals, from woodpeckers to guanacos. The overnight trip introduced many participants to the beauty and camaraderie of backcountry camping. 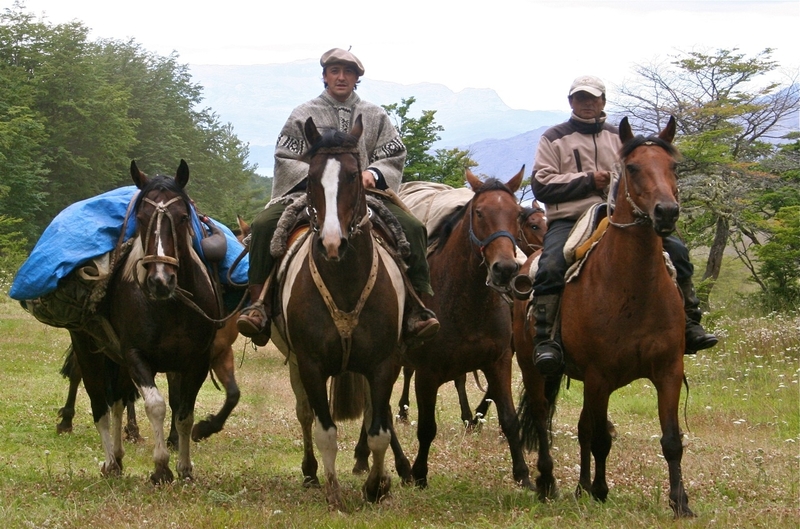 We began the Ruta de Huemul hike six years ago, with a group of forty walking from the town of Cochrane to the Chacabuco Valley. Over the years, this community celebration has morphed and grown. Always well attended, the hike drew the largest crowd yet, an enthusiastic bunch that included three babies, several pregnant women, a troupe of boy scouts, and numerous grandparents. 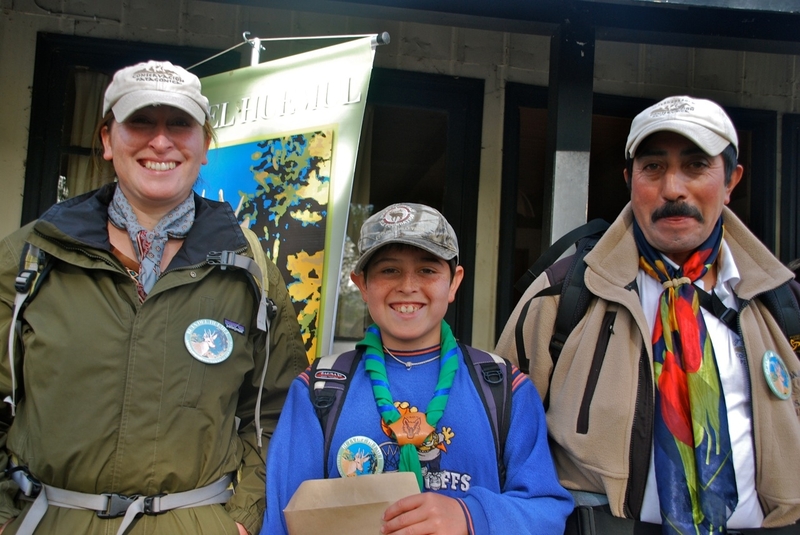 More children and teenagers completed the hike than ever before, making for a lively celebration. Conservacion Patagonica President Kris Tompkins found this year’s hike “the best ever—better organized, more participants, great spirit.” When asked about their experience, almost all hikers commented on the beauty of the route, their sense of accomplishment, and the privilege of sharing this experience with so many others. Early on Friday morning, about a dozen park guards from Conservacion Patagonica and Tamango National Reserve gathered at our office to finalize plans for the hike. Most of them had ridden the route earlier in the week to check the condition of the trail and mark the route. At 9 am, the buses from Cochrane began to arrive, bringing all participants (and their backpacks) to the starting point of the hike. Everyone got an official “Ruta de Huemul” badge and snacks for the day. We split into eight groups of approximately fifteen—a good size to allow people to stay with friends or family members while still getting to know new group mates. With park guards as guides, the groups remained spread apart but in contact throughout the day. By mid-morning, we’d entered the forest. Plants like murtilla and zarzaparilla offered up berries for snacks. Park guards provided interesting tidbits about the native flora and fauna we passed. We stopped often to take photos (almost everyone had brought a camera to record their accomplishments), exchange impressions of the hike, and bird watch. Around lunchtime, the horses made a grand entrance. Several Conservacion Patagonica park guards trotted by, leading the pack horses carrying provisions for our dinner and breakfast. By the time we arrived in camp later in the afternoon, they had set up a kitchen area, started a fire, and begun dinner preparations for all the hungry hikers. Our campsite for the evening, a refugio in Tamango National Reserve, looked out over bright blue Lago Cochrane. The large grassy field provided plenty of tents for the dozens of tents that sprung up soon after our arrival in camp. While many groups of friends hung out in tents, playing cards, singing, or relaxing, others began gathering by the fire, eagerly awaiting dinner. Right on cue, a huemul appeared in the forest nearby, attracting a crowd of eager (but respectful) observers, psyched to see the totem animal of the celebration. Meat was the theme of the night—first churripan, then more meat. Serving food by hiking group allowed the cooks to maintain some order around the busy kitchen area. Kris Tompkins served as Bread Master, handing out rolls to the line of diners. Luigi Solis, in charge of trails for Conservacion Patagonica, manned the meat cooking, with help from park guard Eduardo Castro. After numerous helpings of meat, rounds of mate and conversations with friends new and old, the tired hikers headed to their tents. The next morning, more meat mobilized the crowd for the final kilometers of walking towards the town of Cochrane. The trail meanders along the shore of Lago Cochrane until the lake drains into even more shockingly blue Rio Cochrane. After a few hours of mostly downhill walking, the groups assembled in a large field and hunted for wild strawberries while waiting for all hikers to finish. The regional head of CONAF congratulated all participants while emphasizing the importance of this hike in raising awareness of the plight of the huemul. Kris Tompkins thanked those who organized the event, and all who came to the future Patagonia National Park to walk its trails and demonstrate their interest in protecting nature. The crowd marched up the hill to the closing asado, where over a hundred friends from the future park and town of Cochrane greeted participants with food, traditional music and dancing, commemorative postcards, and plenty of good cheer. 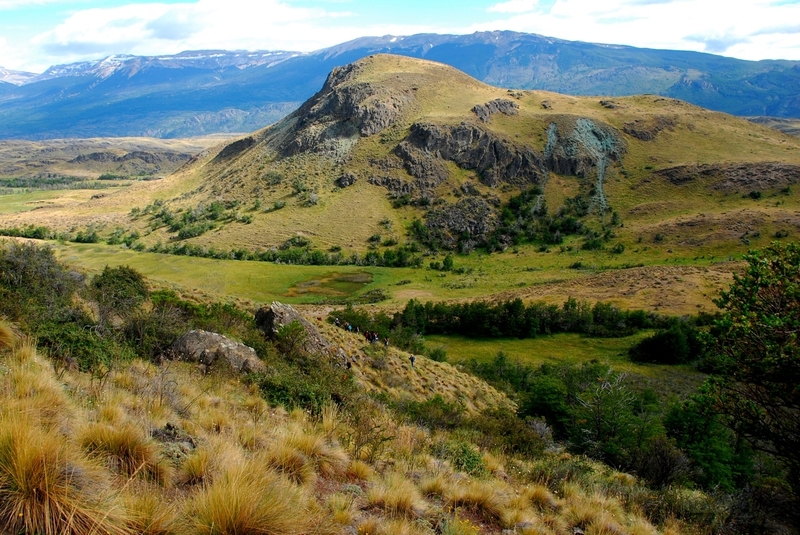 For many, the Ruta de Huemul marked the longest hike they’d ever taken: some participants commented that they had never hiked before. Others, seasoned outdoorsmen, found the experience relaxing and exciting, an opportunity to share what they love with newcomers. All of us at Conservacion Patagonica felt delighted to host an event that physically links the park to our closest neighboring town, a symbol of our shared commitment to the wild future of this region.